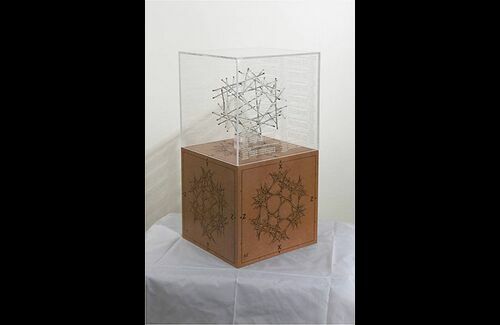 Read here about an artist whose work is inspired by tensegrity, or reflects tensegrity concepts. 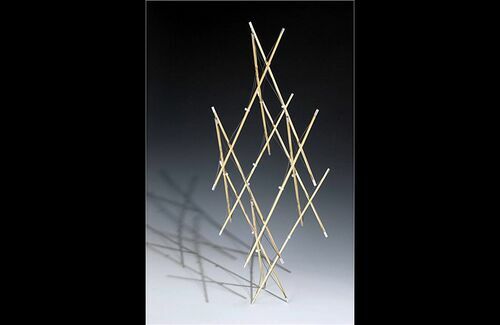 Martin created a series of sculptures, while an MFA student, inspired by tensegrity structural concepts of islanded compression. He named the series "elastegrity". The artist wrote: Elastegrity is an adaptation of the Kenneth Snelson/Buckminster Fuller term “Tensegrity” (meaning a structure consisting of two basic units; tension cables, and compression struts, which operate using “tensional integrity.”) In this case the tension cables (which draw inward in tension) are replaced with elastic wires (which push outward) and the resulting structure maintains its integrity through the compression of struts by the elastic properties of the wire or other spring members. The term “elastegrity” was coined by me to describe these structures which I developed in the Fall of 2009. 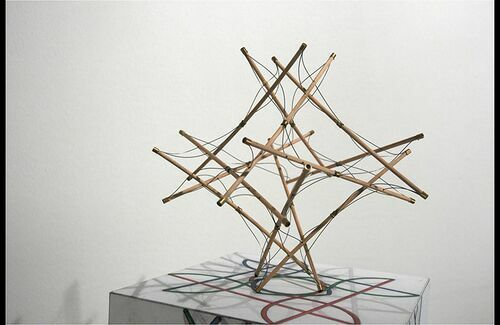 Classic tensegrity structures enforce a radical separation of compression and tension: compression is supplied by isolated or "islanded" struts, while tension is supplied by global closed networks of tendons. The struts have good compressive characteristics and poor tension characteristics; when compressed, they bulge at their perimeter, but when tensed, they snap. In complement with the compression-bearing struts, tendons have good tensile characteristics and poor compressive characteristics. When tensed, they become more narrow in circumference; but when compressed, they fold and offer no resistance. Martin's elastegrity implementation does not divide compression and tension as described above. While struts are used, the tendons are rigid, or "elastic". 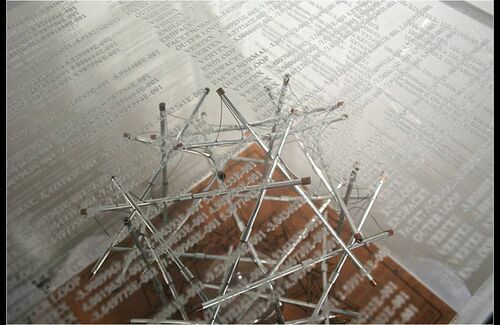 Thus his work combines the tensegrity form with the structure of a wireframe polyhedron. Arnold Patrick Martin is an artist and designer and most recently earned his MFA in Studio Art from the University of Wisconsin in Madison in the spring of 2011. Originally from Flint Michigan, he attended college at Wayne State University in Detroit Michigan where he earned his BFA is Sculpture and Metalsmithing. Since 2011 Arnold’s studio practice has moved from Madison Wisconsin, to Orange California. He has taught sculpture at the University of Wisconsin in Milwaukee and worked as a designer at Drift Studio in Mt. Horeb WI. He was the GLS Artist in Residence from 2010-12 for Games+Learning+Society at UW Madison. He curates the GLS Art and Games Exhibition. Arnold’s studio work is primarily three-dimensional, sculptural, and physical; his process is a hybrid of digital design and 3D modeling employed in the production of physical objects. Using digital design tools and a variety of materials and processes he works to create fantastical, self-contradictory and yet subtly plausible sculptures. Recently Arnold has employed 3D printing to create a series of modular and interchangeable snap-fit models which have been exhibited in San Diego and featured on the maker site Thingiverse as well as BoingBoing. 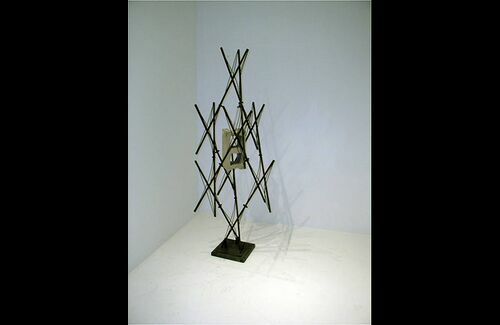 6 strut tensegrity Elastegrity sculpture by Arnold Martin." http://arnoldmartin.com"
Elastegrity sculpture by Arnold Martin." http://arnoldmartin.com"
12 strut tensegrity with suspended cinder block. Elastegrity sculpture by Arnold Martin." 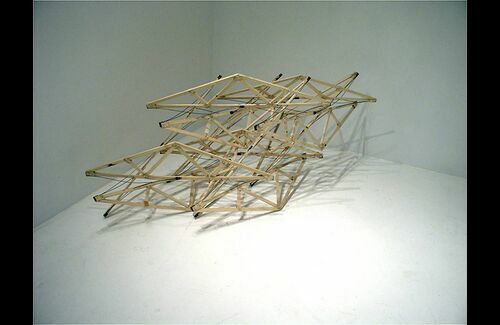 http://arnoldmartin.com"
12 strut tensegrity structure. Elastegrity sculpture by Arnold Martin." http://arnoldmartin.com"